Why Should We Hide Underground Dining? 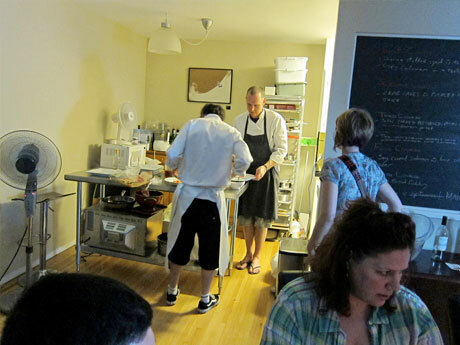 NFA chefs work in the background preparing their culinary creations for guests. On the wall to the right you can see a chalkboard describing the six course set menu. Everyone has by now heard of the trend of underground restaurants. There are those who swear by it and others who argue that it’s a bad idea. I say bring it on. I love the challenge of entertaining group dinner parties and if my friends invited some cool people who showed up with their beverage of choice, and were willing to compensate me for my costs and time, why not? Why should we hide that? Recently a select few Vancouver foodies were invited to sample some culinary offerings from one of Vancouver’s first underground restaurants, NFA, short for No Fixed Address. Hidden in an apartment *somewhere* in Vancouver, chef Steve and sous chef Damian wanted us to sample and comment on new menu items—an assignment I was glad to accept. From the moment we walked in I knew this was something special. Having already had a couple of these “underground” dining experiences under my belt, I was familiar with the routine and was already making comparisons to previous encounters. There was something more polished and refined about chef Steve’s operation than I expected—it felt almost mainstream, but in a good way (if that makes any sense). Soy and ginger marinated salmon with Thai basil on lime chili creme fraiche atop a thin slice of Asian pear. OMG. Like any underground restaurant I suppose, NFA is for those who’ve lost interest in flashy, pretentious dining, but still want memorable culinary experiences lovingly crafted by passionate gastronomes. NFA’s dining room (an apartment living room) was comfortable, flickering candlelight creating a warm ambiance, and the direct interaction with the host chefs, who double as your servers, gave the evening a genuine and intimate feeling. 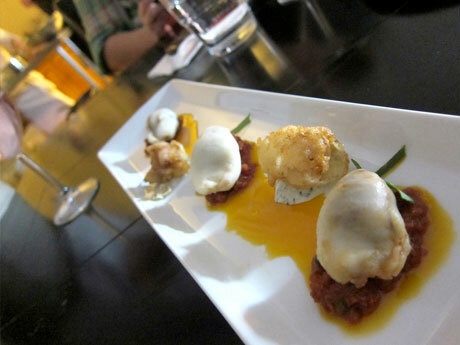 NFA’s medley of marinated squid with various preparations, some stuffed with three types of chorizo, and some battered and fried crispy. NFA’s set menu of six courses served over a couple of hours was a balanced combination of fresh, local ingredients prepared with Asian and Mediterranean flavours in perfect harmony. At first glance a few of the dishes seemed to border on pretentious while avoiding the stacked towers of precariously balanced items surrounded by meticulous squeeze bottle dribbles. After initial bites of each dish, it became obvious why such care was given to their presentation. 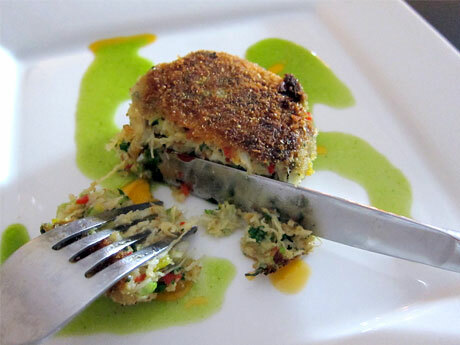 NFA’s Crab & scallop cake. One of the best crab cakes I’ve ever eaten. Not kidding. I’ve been to a few of these now and have hosted something similar myself, so I can say with confidence that chef Steve has created something special with NFA and I recommend everyone try it for themselves. “But it’s an underground restaurant!” you say? No problem. You can find NFA Catering online at nofixedaddresscatering.com, chef Steve at 778-847-3853 or email him at [email protected] and he’ll hook you up with a chance to dine with him yourself. I guess underground dining isn’t so underground anymore. I love all the underground restaurants popping up around Vancouver. 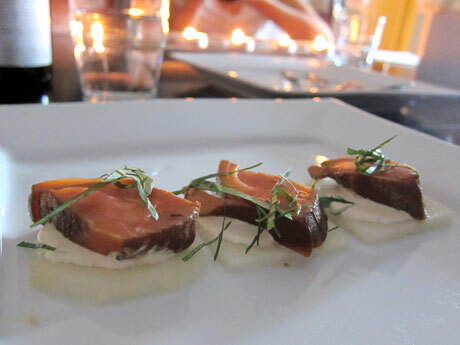 I was at The Endless Meal Supper Club for one of their Social Summer Dinner events and it was fantastic. The food was served family style at the table and was incredibly delicious. Great people, some wine and a beautiful space topped off the evening. It was perfect. Will have to check out NFA next!